You are here: Home / Mutual Funds / What is 200 Day Moving Average? | How to track DMAs? How to use them in Mutual Fund investment decisions? “ Time in the market is more important than timing the market”. It’s time in the market that builds returns, not market timing. It is indeed very difficult to predict when is the best time to enter or exit the market. Financial markets were, are and will be volatile. However, it should be remembered that volatility is the price you pay for the long-term out-performance of equities (Stocks or Mutual funds) over other asset classes. Corrections often provide investors with an opportunity to add to their portfolios at attractive prices (low stock prices / low MF NAVs). We all would like to buy at low and sell at high. As mentioned above, it is very tough to TIME the markets. 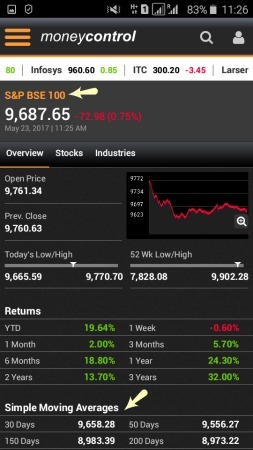 But, are there any indicators/tools to track at-least the downward or upward movements of financial markets or indices? In this post, let’s discuss about – What are Daily Moving Averages? What is 200 Day Moving Average (DMA)? 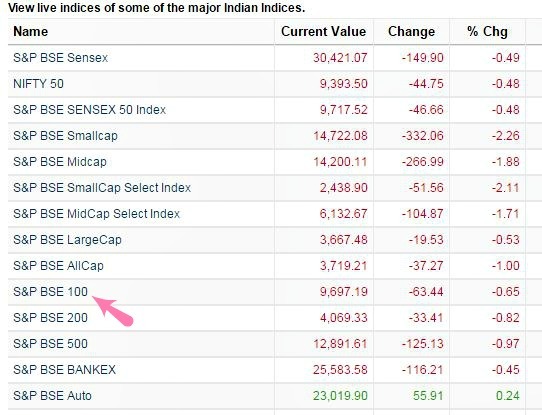 How to track 200 DMAs of Benchmark indices? How to use these indicators when investing in Mutual Funds? What are Daily Moving Averages? A simple moving average is formed by computing the average price of a security or index or MF NAV over a specific number of periods (can be number of days). A 5-day simple moving average is the five day sum of closing prices divided by five. So, a 200-day moving average is the 200 day sum of closing prices/index levels divided by 200. The 200-day moving average is a popular technical indicator which investors can use to analyze price trends. Why 200 DMA? It can be a fairly good indicator of the market / security price trend as it almost captures the past one year data/trend. Let’s say you have an active SIP with SBI Bluechip Mutual Fund Scheme. And, you would like to invest an additional lump sum investment when markets are down. How can this be done so that you can buy at desired NAV levels (at low levels) ? How to track the downward trends? One of the indicators that you can make use of is the 200 day moving average of the benchmark index that is followed by this MF Scheme. How to find out which is the benchmark index of a Mutual Fund Scheme? You may kindly visit moneycontrol.com mutual fund section. You may perform ‘search’ for the concerned MF scheme. 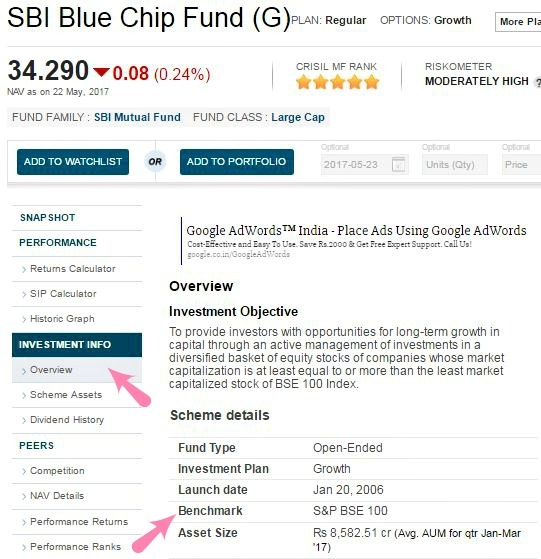 Click on ‘Overview’ section under ‘Investment info’ of a MF Scheme. Once you know the details of benchmark index of your MF scheme, you can track the DMAs of it. 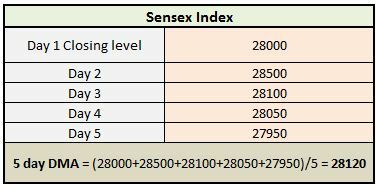 How to check 200 DMA of a benchmark index? You may visit moneycontrol Indices list link. Click on relevant / appropriate benchmark index which you would like to get DMA details. In our case, its S&P BSE 100 (benchmark index for SBI Bluechip fund). If you analyze the simple moving averages in the above image, all the DMAs are currently in upward trend. 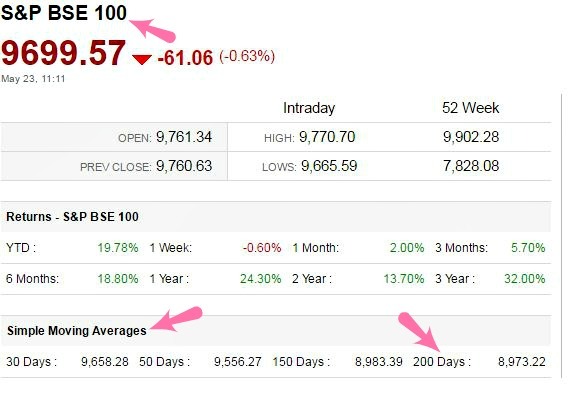 Ideally, if the current benchmark index is below 200 DMA, you may start planning for additional investments in your existing Mutual Fund schemes. Kindly note that once you buy few units, the 200 DMA may fall even further. So, it is absolutely impossible to time your investments. All we wanted here is to accumulate some MF units at lower levels! 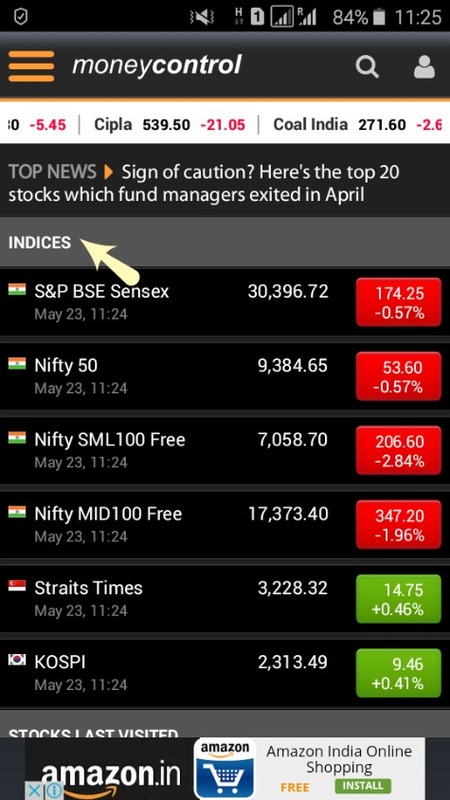 In case, you want to track the benchmark indices on your Smartphone, you may download moneycontrol mobile APP and click on Indices..
You may then select appropriate Benchmark index and can track the DMAs (simple moving averages). Does tracking DMA of funds NAV is same as tracking the DMA of benchmark index ? The DMA concept is same (mathematic/statistical concept). Congrats on your 3 yr blog anniversary. Appreciation and hearty thanks for all your articles and suggestions and prompt reply in your forum. Special thanks for this article. Thank you dear JJ for the wishes and for your post suggestion. I am a farmer,and due to lack of profit in agri commodity, I have sold my all agriculture land Rs15,00,000.I want to invest in mutual fund.My age is 42 year.So please suggest me the best option. Dear ashish .. May I know your investment objective(s) and time-frame? Very informative Srikanth. Thanks a lot. your post is informative and one who want to invest in mutual funds for the first time need to go through this to know how it works.